Post Occupancy Evaluation A POE is a comprehensive examination of the performance of a project or installation after it has been built and used or occupied. A POE helps to answer questions about whether design goals were met and whether the project satisfies the needs of the users, and usually recommends changes or remediation if these needs were not satisfied (Zimring and Reizenstein, 430 – 431). A POE, if it goes beyond mere compliance standards, will also reveal the beneficial contributions that the project makes, which can be used to build a greater foundation of knowledge in design (Zimring and Reizenstein, 447 – 448). This article describes the Indoor Children’s Garden at Longwood Garden following a POE of its strengths and opportunities. A New Type of Garden Longwood Gardens, in Kennett Square, Pennsylvania, is a public garden with one of the oldest indoor children’s gardens in the United States. 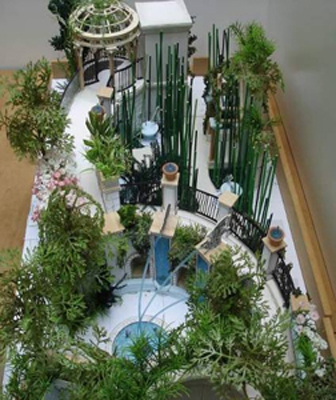 The original Indoor Children’s Garden was started as a trial garden in 1988 based upon research conducted by a Longwood graduate student, Catherine Eberbach. This garden quickly became a lively destination in the Conservatory Building. Ten years later, the demand for the garden far exceeded its capacity. So, a team of Longwood staff members created a new garden that would not only engage children, but would be considered as fine a garden as the others that comprise Longwood Gardens. Horticulturist Mary Allinson, who had been involved in the construction of the previous two children’s gardens, and in-house landscape architect Tres Fromme, visited many children’s gardens to collect ideas. Fromme and Sharon Loving, the Staff Project Manager, both recognized the importance of learning about the interests of children from the children themselves. So, they conducted focus groups during which children were asked to draw or make models of the places they most enjoyed. The children’s results were mazes, water, places to hide, journeys, and places designed at child scale. 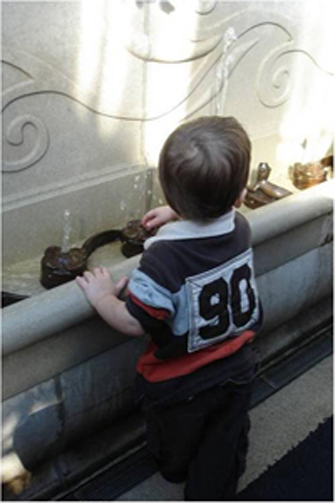 Children were taking the lead in exploring the possibilities, and the parents must have felt that they were peripheral to the experience (Krawczyk, 2008). Encompassing an area of 3,700 square feet, the new garden opened in October 2007. It contained 17 handcrafted bronze and stone fountains, together with other works of art such as murals, tiles, sculptures, and stained glass. It has three types of circulation systems. They include the heart of the garden—the Secret Room, as well as the Grotto, and the Tunnel. These spaces are designed for children, almost to the exclusion of adults. There are additional gathering places, such as the Central Cove, Bamboo Maze, Square Maz, and Ramp that allow for adults as well as children. 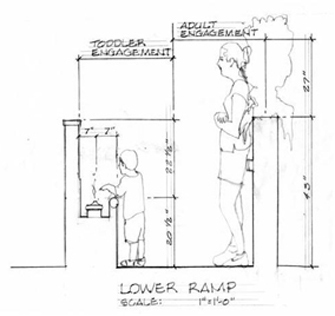 And the periphery walkways are designed for adults (Krawczyk, 2008). From interviews, and my analysis of the behavioral maps, and measurements I made in the garden, I found that one’s experience of the garden depends upon one’s size. Children are exposed to short, intimate views in these child-scaled locations, and everything is within the reach of small children. This encourages activity and engagement. Interior child pathways undulate adjacent to a spine of walls and vegetation, which block views from one garden to another. 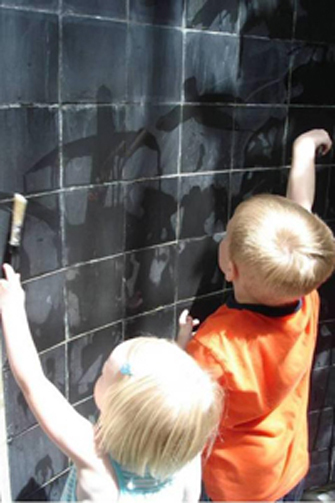 This creates niche-like areas where children can focus on specific activities. 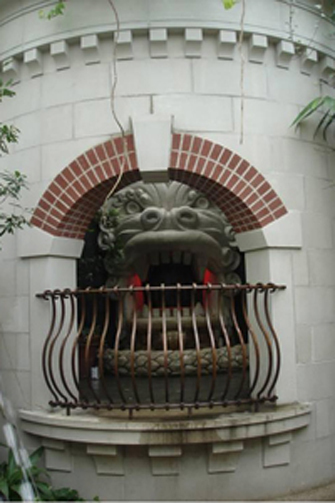 Among these are manipulating the velocity and direction of water in a fountain, or watching for sudden, unexpected arcs of water coming from a wall, a hole in a basin, or from a mouth of an animal. Adults, by contrast, are exposed to long views, which enable them to understand the overall context of the garden and help them to see and, to some degree, supervise children. These long vistas, however, are meant for rapid movement rather than interaction with water, sculptures, or plants. Parents spend a lot of time chasing and finding their exuberant children in this garden. POE Methodology A variety of methods are used in Post-Occupancy Evaluations to take a holistic view of how a place functions ((Zimring and Reizenstein, 440-443). 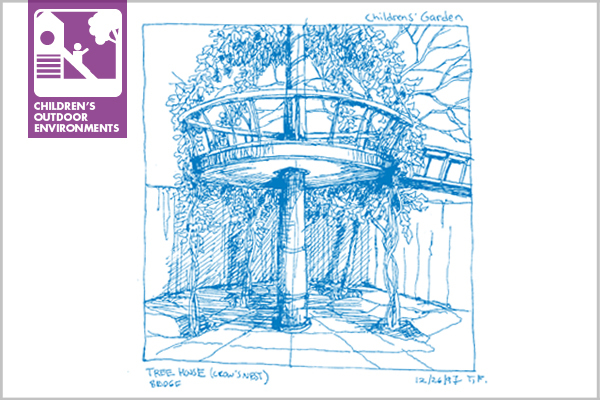 So, to evaluate the Indoor Children’s Garden, I began by reviewing the archives of meeting minutes, sketches, public presentations, and design documents as well as interviewing past and present staff to understand how the garden grew from concept to reality. I also observed where visitors spent most of their time in the garden and their activities, and then created behavioral maps with this information to share with the staff at Longwood Gardens. Over a three-day period, I interviewed87 visitors, from age four through adulthood, to learn about their experiences in the garden—especially regarding their favorite and least favorite places (Zeisel, 290). I measured different elements within the garden, including coping walls, fountains, niches, as well as the arm lengths of visitors. The purpose was to see whether the sizes of things made a difference as to who used them, how they were used, and how important it was for people to touch aspects of the garden. Finally, I analyzed the results of my observations, interviews, and measurements to determine the most and least used aspects of the garden and reasons for these designations (Cooper Marcus and Francis, 353). Findings Where did people spend the most time in this garden? I compared my observations of where people tended to gather most in the garden with the measurements I recorded of the features in the garden to show who the primary users were. The result was that the top five places in the Indoor Garden were the Central Cove (135 visitors); Lower Ramp (125); Upper Ramp (52); Bamboo Maze (32); and Grotto (28). What did visitors do in these places? I quickly learned that the Indoor Children’s Garden is a place for water play. The Central Cove contains the greatest number and types of fountains in the Indoor Children’s Garden. And when the niche fountains in the Central Cove are turned off, the niches provide seating for families. Then, the circular fountain in the Cove affords the ideal place for contained, focused water play. 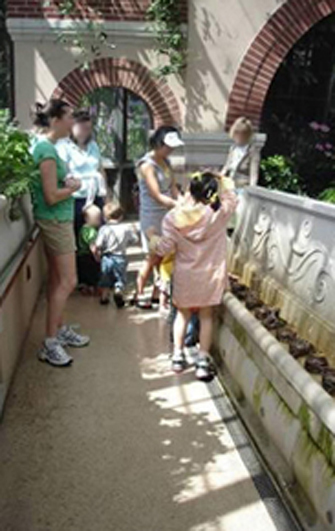 Young children tended to congregate on the Lower Ramp, spending at least 15 minutes manipulating the sprays of water there. From my observations and interviews of parents, I learned that many of these children came with their parents or caregivers during quieter mornings and spent over an hour in the Indoor Garden. I observed them returning to the Ramp many times, spending upwards of 30 minutes playing in the fountains. As previously noted, the Secret Room is the heart of the garden and is also designed to be in scale with children, not adults. The door openings are five feet high, permitting children to enter with ease. Unfortunately, my interviews with staff revealed that most of the injuries in the garden occurred in these doorways. Parents who were chasing their children in this area tended to not to notice the height of the doors and would hit the threshold. Suggestions to address this situation following the POE, include raising the doorways to a standard size opening and using vines to create a lower visual threshold, or have Longwood staff monitor the doorways (Cooper Marcus and Francis, 347). In conclusion, the POE of the Indoor Children’s Garden reveals that this garden engages people, especially children, for a number of reasons: 1) Water is a powerful element that engages people of all ages. 2) While people are attracted to things through sight, they tend to engage with the environment when they can touch it. 3) The configuration of space considers both activities and the “scale” of the users. 4) The climate of the indoor children’s garden provides a stable environment regardless of weather. These characteristics provide opportunities that are not always found in traditional children’s gardens – but should be! Carol A. Krawczyk, ASLA, is the principal of Research-Based Design. She specializes in the design of children’s environments and performance of evaluative and research methods. Endnote Tres Fromme has since left Longwood Gardens and established his own firm, 3.fromme DESIGN. Cooper Marcus, C. and Francis, C. “Post-Occupancy Evaluation,” in People Places. NY: John Wiley & Sons, Inc. 1988.1. Zimring, C. M. and Reizenstein, J. E. “Post-Occupancy Evaluation: An Overview.” Environment and Behavior, 12 (4). 1980. Eberbach, C. Garden Design for Children. Newark, Delaware: University of Delaware, Master’s Thesis. 1988. Accessed March 26, 2012. http://dspace.udel.edu:8080/dspace/handle/19716/3101. Fromme, T. (2003). 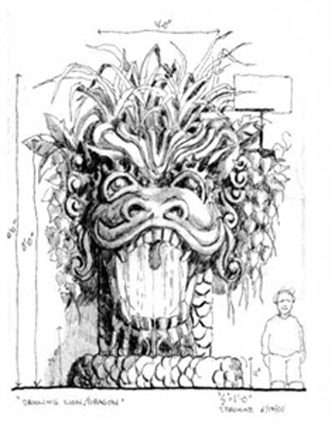 “Protean visions and plastic dreams: Designing a garden for children,” Roots 26, 6, July 2003. Accessed March 26, 2012. http://www.bgci.org/files/Worldwide/Education/Roots_PDFs/Roots_26_articles/tres_fromme.pdf. Krawczyk, C. A. “Telephone interview with Tres Fromme,” June 30, 2008. 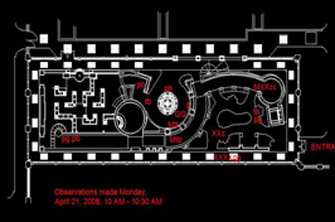 Longwood Gardens’ website, accessed July 1, 2008. http://www.longwoodgardens.org/IndoorChildrensGarden_1_3_5_5.html. Zeisel, J. Inquiry by Design, Revised Edition. NY: W. W. Norton & Company. 2006.